If you don’t want to miss the HSV playing while you’re visiting Berlin: Be our guest! Join us and our support! 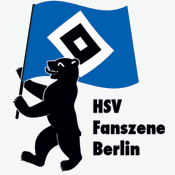 We are the local supporters group of the HSV: the OFC HSV-Fanszene Berlin. We are one of more than 1000 official fanclubs (OFC) of the HSV worldwide. We are proud to be part of such a big family! Founded in 2006 the OFC HSV-Fanszene Berlin aims to rally the Berlin based supporters of the Hamburger SV, and there are plenty in Berlin. Together we watch the games of our beloved HSV, we suffer, we moan, and sometimes even celebrate small and big victories. We believe that support may start in a local pub like our The Dubliners, but naturally belongs in the football stadium. That’s why we organise ticktes for our members, and frequently plan tours to home and away matches. We stay in touch with other local OFCs in Brandenburg, and with the always dedicated staff of the Supporters Club in Hamburg. The OFC HSV-Fanszene Berlin meets in a bar called Big Apple, Berliner Str. 77 in 13189 Berlin (Pankow). The Big Apple broadcasts every match of the HSV (big screen and several additional TV screens). Please note: as the Big Apple is a smoking bar, access is restricted to people aged 18 years or older.